A popular stretch of Duluth's scenic Skyline Parkway will be closed for most of the summer, starting Monday, April 23. The portion of Skyline Parkway between the intersection with Hank Jensen Drive and West 5th Street near Enger Tower will be closed as crews work to restore the retaining wall that is a structural component of the roadway. The project impacts a high-traffic scenic overlook for both residents and tourists alike that provides a great view of the lift bridge, harbor, and is a popular viewpoint for the 4th of July fireworks. Crews estimate the project to be done by August 24, meaning those that utilize this location for catching a scenic view or watching the fireworks will need to find a different spot this summer. 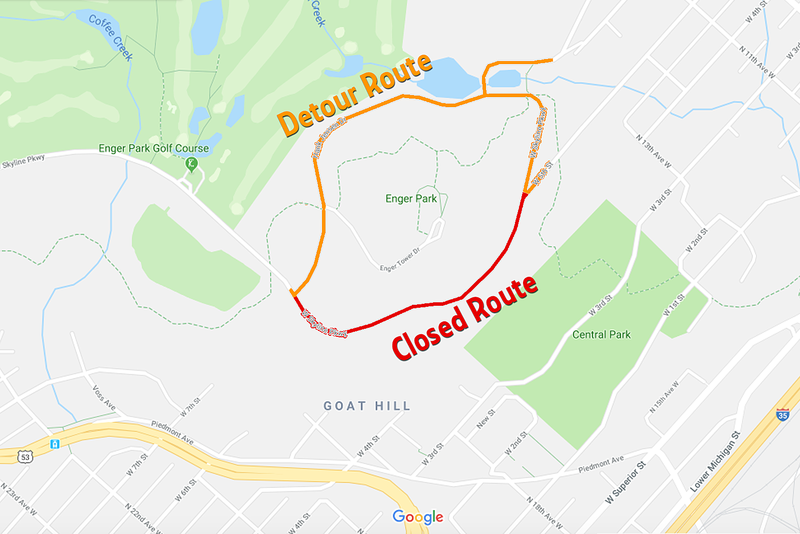 Traffic will be rerouted along Hank Jensen Drive around Enger Tower, reconnecting with Skyline Parkway at Twin Ponds. Crews will also be working on a second piece of Skyline Parkway later this summer, completing similar retaining wall work at the Oneota Overlook between 24th Avenue West and 40th Avenue West. Exact dates for this project have not yet been determined.